A silva is a work written to describe the trees of a particular region, and this monumental work, 21 years in the making, set out to describe and illustrate all the trees growing north of Mexico. Charles Sprague Sargent (1841–1927) was a botanist, Harvard professor, and the first director of Harvard’s Arnold Arboretum. He became the country’s foremost expert on trees and directed the nation’s first census of trees. It was during this census that Sargent envisioned a more thorough accounting of trees, one that would describe and illustrate all their physical aspects, their locations, economic importance, historical backgrounds, ecological roles, and the lives of the explorers and naturalists who first saw and described the trees. The final 14-volume work described 585 trees illustrated by C. E. Faxon’s 744 splendid plates. Once the last of the large folio volumes had been printed, a simplified, more affordable and portable volume was prepared in 1905, Manual of the Trees of North America, exclusive of Mexico. 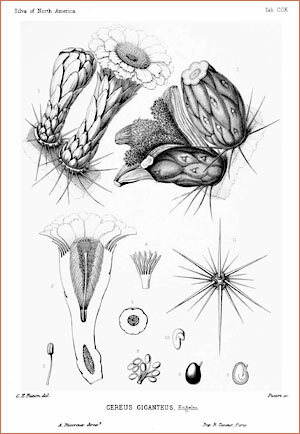 Silva of North America, Volume V Plate CCX, "Cereus giganteus". Charles Edward Faxon, Illustrator. image courtesy Missouri Botanical Garden www.botanicus.org.